For the medieval emperor, see Frederick III, Holy Roman Emperor. Frederick III (German: Friedrich III., Deutscher Kaiser und König von Preußen; 18 October 1831 – 15 June 1888) was German Emperor and King of Prussia for 99 days in 1888, the Year of the Three Emperors. 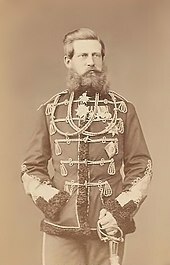 Friedrich Wilhelm Nikolaus Karl, known informally as Fritz, was the only son of Emperor Wilhelm I and was raised in his family's tradition of military service. Although celebrated as a young man for his leadership and successes during the Second Schleswig, Austro-Prussian and Franco-Prussian wars, he nevertheless professed a hatred of warfare and was praised by friends and enemies alike for his humane conduct. 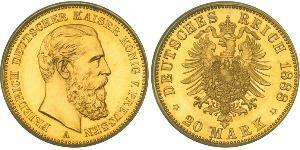 Following the unification of Germany in 1871 his father, then King of Prussia, became the German Emperor. On Wilhelm's death at the age of 90 on 9 March 1888, the throne passed to Frederick, who had by then been Crown Prince for 27 years. Frederick was suffering from cancer of the larynx when he died on 15 June 1888, aged 56, following unsuccessful medical treatments for his condition. Frederick married Princess Victoria, eldest daughter of Queen Victoria of the United Kingdom. The couple were well matched; their shared liberal ideology led them to seek greater representation for commoners in the government. Frederick, in spite of his conservative militaristic family background, had developed liberal tendencies as a result of his ties with Britain and his studies at the University of Bonn. As the Crown Prince, he often opposed the conservative Chancellor Otto von Bismarck, particularly in speaking out against Bismarck's policy of uniting Germany through force, and in urging that the power of the Chancellorship be curbed. Liberals in both Germany and Britain hoped that as emperor, Frederick III would move to liberalize the German Empire. Frederick and Victoria were great admirers of the Prince Consort of the United Kingdom, Victoria's father. They planned to rule as consorts, like Albert and Queen Victoria, and to reform what they saw as flaws in the executive branch that Bismarck had created for himself. The office of Chancellor, responsible to the Emperor, would be replaced with a British-style cabinet, with ministers responsible to the Reichstag. Government policy would be based on the consensus of the cabinet. Frederick "described the Imperial Constitution as ingeniously contrived chaos." Despite the value placed by the Hohenzollern family on a traditional military education, Augusta insisted that her son also receive a classical education. Accordingly, Frederick was thoroughly tutored in both military traditions and the liberal arts. His private tutor was Ernst Curtius, a famous archaeologist. Frederick was a talented student, particularly good at foreign languages, becoming fluent in English and French, and studying Latin. He also studied history, geography, physics, music and religion, and excelled at gymnastics; as required of a Prussian Prince, he became a very good rider. 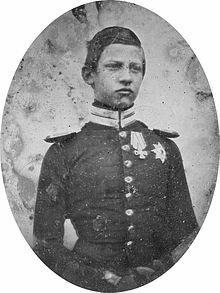 Hohenzollern princes were made familiar with the military traditions of their dynasty at an early age; Frederick was ten when he was commissioned as a second lieutenant into the First Infantry Regiment of Guards and invested with the Order of the Black Eagle. As he grew older, he was expected to maintain an active involvement in military affairs. But, at the age of 18, he broke with family tradition and entered the University of Bonn where he studied history, law and governance and public policy. During his time at Bonn (1850-1852), his teachers included Ernst Moritz Arndt and Friedrich Christoph Dahlmann. His time spent at the university, coupled with the influence of less conservative family members, were instrumental in his embrace of liberal beliefs. Royal marriages of the 19th century were arranged to secure alliances and to maintain blood ties among the European nations. As early as 1851, Queen Victoria of Great Britain and her consort Prince Albert were making plans to marry their eldest daughter, Victoria, Princess Royal, to Frederick. The royal dynasty in Britain was predominantly German; there was little British blood in Queen Victoria, and none in her husband. The monarchs desired to maintain their family's blood ties to Germany, and Prince Albert further hoped that the marriage would lead to the liberalization and modernization of Prussia. King Leopold I of Belgium, uncle of the British monarch and consort, also favoured this pairing; he had long treasured Baron Stockmar's idea of a marriage alliance between Britain and Prussia. Frederick's father, Prince William, had no interest in the arrangement, hoping instead for a Russian Grand Duchess as his daughter-in-law. 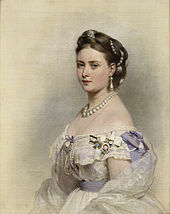 However, Princess Augusta was greatly in favour of a match for her son that would bring closer connections with Britain. In 1851, his mother sent Frederick to England, ostensively to visit the Great Exhibition but in truth she hoped that the cradle of liberalism and home of the industrial revolution would have a positive influence on her son. Prince Albert took Frederick under his wings during his stay but it was Albert's daughter, only eleven at the time, who guided the German prince around the Exhibition. A regular exchange of letters between Victoria and Frederick followed. The betrothal of the young couple was announced in April 1856, and their marriage took place on 25 January 1858 in the Chapel of St. James's Palace, London. To mark the occasion, Frederick was promoted to Major-General in the Prussian army. Although it was an arranged marriage, the newlyweds were compatible from the start and their marriage was a loving one; Victoria too had received a liberal education and shared her husband's views. Of the two, Victoria was the dominant one in the relationship. The couple often resided at the Crown Prince's Palace and had eight children: Wilhelm in 1859, Charlotte in 1860, Henry in 1862, Sigismund in 1864, Victoria in 1866, Waldemar in 1868, Sophie in 1870 and Margaret in 1872. Sigismund died at the age of 2 and Waldemar at age 11, and their eldest son, Wilhelm, suffered from a withered arm—probably due to his difficult and dangerous breech birth, although it could have also resulted from a mild case of cerebral palsy. Wilhelm, who became emperor after Frederick's death, shared none of his parent's liberal ideas; his mother viewed him as a "complete Prussian". This difference in ideology created a rift between Wilhelm and his parents, and relations between them were strained throughout their lives. Because William was a dogmatic soldier and unlikely to change his ideas at the age of sixty-four, he regularly clashed with the Diet over policies. In September 1862, one such disagreement almost led to Frederick being crowned and replacing his father as king; William threatened to abdicate when the Diet refused to fund his plans for the army's reorganization. Frederick was appalled by this action, and said that an abdication would "constitute a threat to the dynasty, country and Crown". William reconsidered, and instead on the advice of Minister of War Albrecht von Roon appointed Otto von Bismarck, who had offered to push through the military reform even against the majority of the Diet, as Minister-President. The appointment of Bismarck, an authoritarian who would often ignore or overrule the Diet, set Frederick on a collision course with his father and led to his exclusion from affairs of state for the rest of William's reign. Frederick insisted on bloodless "moral conquests", unifying Germany by liberal and peaceful means, but it was Bismarck's policy of blood and iron that prevailed. His protests against William's rule peaked at Danzig on 4 June 1863, where at an official reception in the city he loudly denounced Bismarck's restrictions on freedom of the press. He thereby made Bismarck his enemy and his father extremely angry. Consequently, Frederick was excluded from positions of political power throughout his father's reign. Retaining his military portfolio, he continued to represent Germany and its Emperor at ceremonies, weddings, and celebrations, such as Queen Victoria's Golden Jubilee in 1887. Frederick fought in the wars against Denmark, Austria and France. Although he had opposed military action in each case, once war had started he supported the Prussian military wholeheartedly and took positions of command. Since he had no political influence at all, these were opportunities to prove himself. Frederick experienced his first combat in the Second Schleswig War. 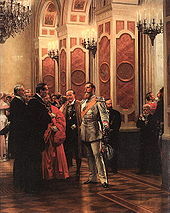 Appointed to supervise the supreme German Confederation commander Field Marshal Wrangel and his staff, the Crown Prince tactfully managed disputes between Wrangel and the other officers. The Prussians and their Austrian allies defeated the Danes and conquered the southern part of Jutland, but after the war they spent two years politicking to assume leadership of the German states. This culminated in the Austro-Prussian War. Frederick "was the only member of the Prussian Crown Council to uphold the rights of the Duke of Augustenberg and oppose the idea of a war with Austria which he described as fratricide." Although he supported unification and the restoration of the medieval empire, "Fritz could not accept that war was the right way to unite Germany.". However, when war with Austria broke out, he accepted command of one of Prussia's three armies, with General Leonhard Graf von Blumenthal as his chief of staff. 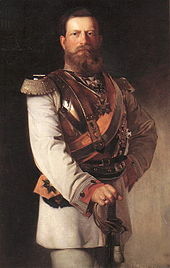 The timely arrival of his II Army was crucial to the Prussian victory in 1866 at the decisive Battle of Königgrätz, which won the war for Prussia. After the battle, William presented Frederick with the Order Pour le Mérite for his personal gallantry on the field and leadership of the II Army. Nevertheless, the bloodshed caused him great dismay. A few days before Königgrätz, Frederick had written to his wife, expressing his hope that this would be the last war he would have to fight. On the third day of the battle he wrote to her again: "Who knows whether we may not have to wage a third war in order to keep what we have now won?" In 1871, following Prussia's victories, the German states were united into the German Empire, with William as the Emperor and Frederick as heir-apparent to the new German monarchy. Although William thought the day when he became Emperor the saddest of his life, Frederick was excited to be witness to a great day in German history. Bismarck, now Chancellor, disliked Frederick and distrusted the liberal attitudes of the Crown Prince and Princess. Often at odds with his father's and Bismarck's policies and actions, Frederick sided with the country's liberals in their opposition to the expansion of the empire's army. The Crown Prince also became involved in many public works projects, such as the establishment of schools and churches in the area of Bornstedt near Potsdam. To assist his father's effort to turn Berlin, the capital city, into a great cultural centre, he was appointed Protector of Public Museums; it was largely due to Frederick that considerable artistic collections were acquired, housed in Berlin's new Kaiser Friedrich Museum (later known as the Bode Museum) after his death. In 1878, when his father was incapacitated by injury from an assassination attempt, Frederick briefly took over his tasks but was soon relegated to the sidelines once again. His lack of influence affected him deeply, even causing him to think about suicide. Germany's progressive elements hoped that William's death, and thus Frederick's succession, would usher the country into a new era governed along liberal lines. The conservative William, however, lived a long life, dying at the age of 90 on 9 March 1888. Logically, Frederick should have taken as his regnal name either Frederick I (if the Bismarckian empire was considered a new entity) or Frederick IV (if it was considered a continuation of the old Holy Roman Empire, which had had three emperors named Frederick); he himself preferred the latter. However, on the advice of Bismarck that this would create legal problems, he opted to simply keep the same regnal name he had as king of Prussia. By the time he ascended the throne, Frederick was 56 years old and suffering from a debilitating cancer of the larynx. He viewed his illness with dismay, crying "To think I should have such a horrid disgusting illness ... I had so hoped to have been of use to my country." He received conflicting medical advice regarding treatment. [page needed] In Germany, Doctor Ernst von Bergmann proposed to remove the larynx completely, but his colleague, Doctor Rudolf Virchow, disagreed; such an operation had never been performed without the death of the patient. The British doctor Sir Morell Mackenzie, who had diagnosed the cancer, advised a tracheotomy, to which Frederick and his wife agreed. On 8 February, a month before his father died, a cannula was fitted to allow Frederick to breathe; for the remainder of his life he was unable to speak and often communicated through writing. During the operation, Dr. Bergmann almost killed him by missing the incision in the trachea and forcing the cannula into the wrong place. Frederick started to cough and bleed, and Bergmann placed his forefinger into the wound to enlarge it. The bleeding subsided after two hours, but Bergmann's actions resulted in an abscess in Frederick's neck, producing pus which gave the new Emperor discomfort for the remaining months of his life. Later, Frederick would ask "Why did Bergmann put his finger in my throat?" and complain that "Bergmann ill-treated [me]". The diagnosis and treatment of Prince Frederick's fatal illness caused some medical controversy well into the next century. In spite of his illness, Frederick did his best to fulfill his obligations as Emperor. Immediately after the announcement of his accession, he took the ribbon and star of his Order of the Black Eagle from his jacket and pinned it on the dress of his wife; he was determined to honor her position as Empress. As the German Emperor, he officially received Queen Victoria of the United Kingdom (his mother-in-law) and King Oscar II of Sweden and Norway, and attended the wedding of his son Prince Henry to his niece Princess Irene. However, Frederick reigned for only 99 days, and was unable to bring about much lasting change. An edict he penned before he ascended to the throne that would limit the powers of the chancellor and monarch under the constitution was never put into effect, although he did force Robert von Puttkamer to resign as Prussian Minister of the Interior on 8 June, when evidence indicated that Puttkamer had interfered in the Reichstag elections. Dr. Mackenzie wrote that the Emperor had "an almost overwhelming sense of the duties of his position". In a letter to Lord Napier, Empress Victoria wrote "The Emperor is able to attend to his business, and do a great deal, but not being able to speak is, of course, most trying." Frederick had the fervour but not the time to accomplish his desires, lamenting in May 1888, "I cannot die ... What would happen to Germany?" Frederick III died in Potsdam on 15 June 1888, and was succeeded by his 29-year-old son Wilhelm II. 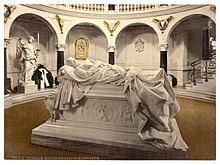 Frederick is buried in a mausoleum attached to the Friedenskirche in Potsdam. After his death, William Ewart Gladstone described him as the "Barbarossa of German liberalism". Empress Victoria went on to continue spreading Frederick's thoughts and ideals throughout Germany, but no longer had power within the government. Frederick's children—Wilhelm in particular—held various political positions and greatly influenced Europe. Unlike his father, Wilhelm had not personally experienced the horrors of war, and he enthusiastically embraced his family's military heritage, coming under Bismarck's tutelage. The Chancellor, who disapproved of Frederick's and Victoria's liberal ways, felt bound to increase the tensions between Wilhelm and his parents. Wilhelm grew up full of disdain for their opinions on government, and shortly after his father's death, proclaimed that he would follow the path of his grandfather, William I. He made no reference to Frederick III. William II abandoned all of his father's policies and ideas, and eventually led Germany into World War I. At the age of ten he was invested with the Order of the Black Eagle. Following his victory at the Battle of Königgrätz, he received the Order Pour le Mérite for his leadership during the battle. Prince Sigismund 15 September 1864 18 June 1866 died of meningitis at 21 months. First grandchild of Queen Victoria to die. ^ a b c Kollander, p. 79. ^ a b c d e f g h i j k Oster, Uwe A. "Friedrich III. - Der 99-Tage-Kaiser". Damals (in German) 45 (3/2013): 60–65. ISSN 0011-5908. ^ a b Röhl, p. 101. Chalat, Ned (October 1984). "Sir Morell Mackenzie Revisited". The Laryngoscope 94 (10): 1307–1310. doi:10.1288/00005537-198410000-00009. PMID 6384708. Dorpalen, Andreas (October 1948). "Emperor Frederick III and the German Liberal Movement". The American Historical Review (American Historical Association) 54 (1): 1–31. doi:10.2307/1841754. JSTOR 1841754. McCullough, J. (March 1930). "An Imperial Tragedy: Frederick III and the Letters of the Empress". The Canadian Medical Association Journal: 403–409. Oster, Uwe A. (2013). "Zur Untätigkeit verdammt" [Condemned to Inactivity]. Damals (in German) 45 (3): 60–65. "The Crown Prince Frederick William of Prussia". The Illustrated London News. 20 August 1870. p. 185. The War Diary of the Emperor Frederick III, (1870-1871) Written by Frederick III, translated and edited by Alfred Richard Allinson. New York, Frederick A. Stokes Company, 1927. - This is the translated collection of the then Crown Prince Frederick's war diaries that he kept during the Franco-Prussian War. 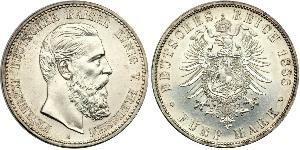 1888 Friedrich III. (German) Information about Frederick III from Preussen.de. Kaiser Friedrich III / Frederick III Information about Frederick III from GlobalSecurity.org. 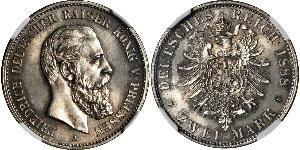 Kaiser Friedrich III (German) Site with biographical info, pictures, and paintings of Frederick III.